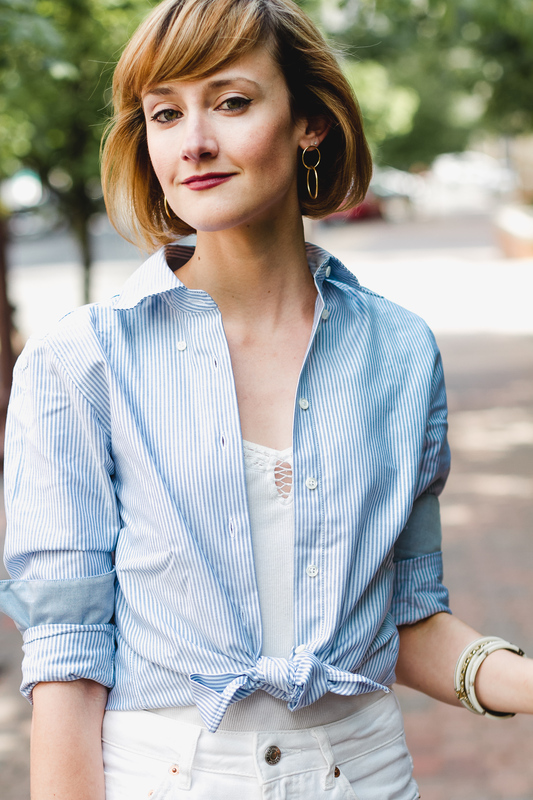 Is there anything better than a perfect striped button-down? Not too sheer, flattering, but not too fitted, made with Supima cotton that only softens and gets more wonderful the more you wash it. In my opinion, there are few better articles of clothing to have in one’s closet. 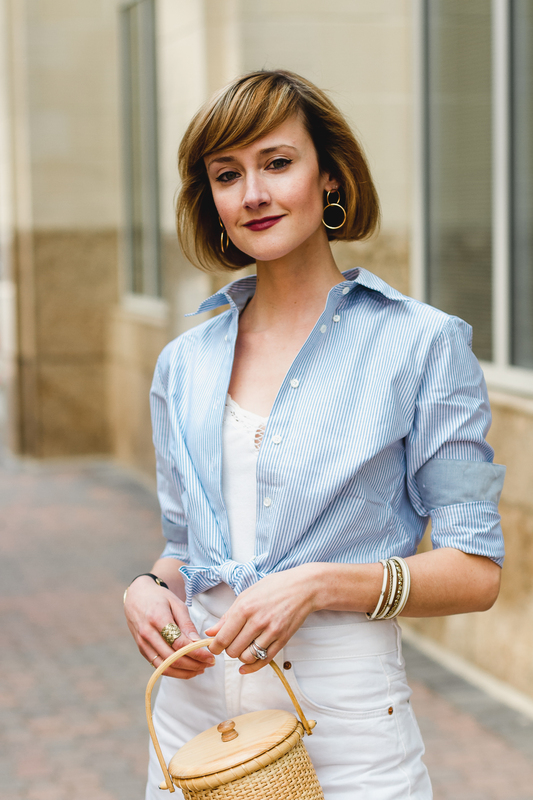 Brooks Brothers’ classic oxfords have been my go-to for years so it kind of made my heart swell with joy when they sent me one of their latest to style for their spring #OwnYourOxford campaign. 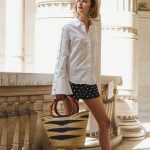 I love the tied shirt look for summer and pairing it with soft white pieces makes me fantasize about strolling along the French Riviera. A girl can dream, right? I love a good oxford shirt! 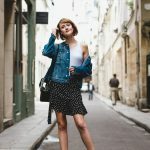 This is the most perfect summer outfit!! You look gorgeous! That shirt is classic perfection indeed, and I just love the white jeans. That look is so cute. I love the wide legged pants. Such a fresh, summery look. Perfect for the French Riviera! Love your sandals and shirt tied around the waist!!! You look absolutely stunning! Those heels are beautiful and I love your shirt too! Such a classy look – thanks for sharing. Every girl needs a good oxford shirt! So basic but super wearable. Such a chic and sassy look! Love the striped blue button-down shirt, it’s lovely with the white denims. Also, gorgeous heels you got there too dear. your outfit just is incredible. I love pairing a basket bag with everything lately. Oxfords are true classics ! I love how you have styled this! Couldn’t be any more chic or classic yet still so modern and cool. How do you do that?! I haven’t shopped at Brooks Brothers. You look so good in their pieces! 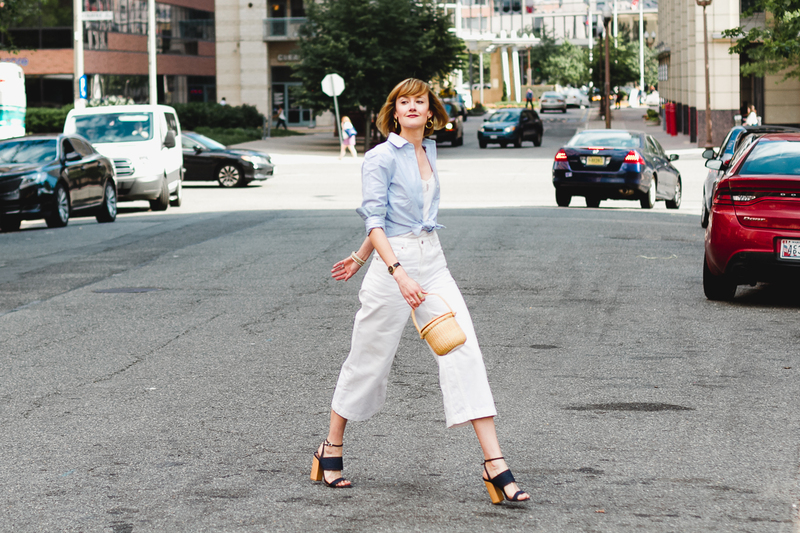 Yes, this outfit totally has that French Riviera vibe! Those pants look amazing on you! !